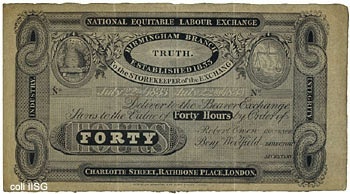 A "labour-time" voucher issued by Robert Owen . Not suitable for use in socialism despite Marx's erroneous endorsement on the idea as a temporary measure before free access. 1. Labour-time accounting or calculation in kind ? In 1920 Ludwig von Mises published an article “Die Wirtschaftsrechnung im sozialistischen Germeinwesen” , which was translated into English in 1935 as “Economic Calculation in the Socialist Commonwealth” and published in Collectivist Economic Planning: Critical Studies on the Possibilities of Socialism edited by Fron Hayek. His basic argument was that socialism would be impossible because , without money and prices fixed by the market , society would not be able to do economic calculations rationally. Or , as he put it , “ where there is no free market there is no pricing mechanism; without a pricing mechanism, there is no economic calculation”. Von Mises defined socialism to mean any system in which the ownership of the means of production by private individuals was entirely abolished. His definition thus covered total State Capitalism as well as socialism. This makes some of his arguments, in so far as they were meant to be arguments against socialism irrelevant, but in arguing against the possibility of a moneyless society he was also arguing against socialism. He did not deny that “labour-time” could theoretically provide an alternative unit of economic calculation , but argued that in practice it would be impossible to establish an accurate labour-time unit because of the difficulty of measuring the intensity and skill of different peoples’ labour . The only possible unit of economic calculation , he concluded , was therefore money . The Social Democrats , including the Bolsheviks ( who were of course Social Democrats up to 1917 ) , tended to have a technocratic conception of “socialism” which in practice , as we have already remarked , made them advocates of state capitalism rather than of socialism As a result discussion on what should be the unit of calculation in socialism was largely a discussion of what should be the unit of calculation in state capitalism . This meant in fact that the outcome of the debate was predictable from the start : the partisans of retaining money , as Kautsky advocated in 1922, as “ a measure of value for accounting purposes and for calculating exchange ratios “ were bound to win since , in the long run , this was the only solution compatible with the operation of the capitalist system which they wanted to continue, even though in a statised form. The partisans of accounting in labour-time and those of accounting in real physical quantities were never more than marginal and by the end of the 1920s had disappeared both amongst the Social Democrats and amongst the Bolsheviks . Calculation in labour-time was defended by the Social Democratic writer , Otto Leichter , in his Die Wirtschaftsrechnung in der sozialistischen Gesellschaft ( Economic Calculation in Socialist Society ) published in Vienna in 1923. , in which he argued that this was perfectly feasible as it was already applied under capitalism by accountants to fix prices and by time-and -motion experts. Money , he argued , could therefore be abolished in socialism (= state-capitalism) , even for the distribution of consumer goods , which could be distributed directly to consumers in kind in amounts fixed by nutrition and other experts . As the last part of the passage indicates , Neurath too argued that consumer goods could be directly allocated to people in kind . An attempt to present an alternative to what they called the “State socialism” of both the Social Democrats and the Bolsheviks was made by a group of Dutch “Council Communists” in their Grundprinzepien kommunistcher Verteilung un Produktion ( Basic principles of communist distribution and production ) published in Berlin , in 1930 . The “Council Communists” were a group which had supported the Russian Revolution , really believing it to be what , in its propaganda , it said it was , namely a soviet ( the Russian word for “council”) revolution . Within a few years , however , they realised their error and that Russia was heading rather for state capitalism . They called themselves “Council” Communists to distinguish themselves from the “State Communists” such as Lenin , Trotsky and Stalin . The Grundprinzipien outlined a plan for organising the production and distribution of wealth without money but on the bais of accounting in units of labour-time . They followed Otto Leichter here , but totally rejected the technocratic structure in which he has seen labour - time accounting replacing monetary calculation . In its place they proposed a federation of workers’ councils .But when this plan is stripped of its socialist terminology , it turns out to be a scheme for a sort of self-regulating exchange economy in which money as we know it today would be replaced as a currency by a “labour-money” ; in other words , the money-prices-wages system would continue to exist but would be run by workers councils and without exploitation . But to believe that an exchange economy could function in the interests of the workers if labour-money and labour-time accounting were to be used in place of the coins and notes and monetary calculation we know it today is to completely misunderstand how capitalism works and to fall into the purest currency-crankism. In the end , then , it was Otto Neurath , with his view that socialist society could organise the production an distribution of wealth directly and solely in kind , who was on the right track . The only other personality in the Social Democratic and Bolshevik movements to take this view was Amadeo Bordiga , but not until the 1950s and in a quite different context to the so-called “economic calculation” controversy sparked off by Von Mises in 1920. “ If there is accumulation in socialism , it will take the form of accumulation of objects , of materials , useful to human needs , and these will have no need to appear alternatively as money , nor to undergo the application of a “moneymeter” allowing them to be measured and compared according to a “general equivalent” . Thus these objects will no longer be commodities and will no longer be defined except by their quantitative physical magnitude and by their qualitative naure , what the economists , and Marx also , for explanatory purposes , express by the term use-value” ( A Bordiga , Structure economique et sociale de la Russia d’aujourd’hui , Paris , 1975 pp191-2) . This is undoubtedly the correct position . Calculation in socialism can only be done directly in physical quantities without the need for any “general equivalent” or any general accounting unit , certainly not money but not labour-time either. Basically , socialism does not need any general equivalent . Such a universal unit in which all goods can be expressed is only necessary in an exchange economy where all goods have to be produced to some common denominator as a means of determining the proportions in which they exchange for one another . Capitalism is in fact not just an exchange economy but an exchange economy where the aim of production is to make a profit .This too requires a general equivalent in order to be calculated and measured . Profit is the monetary expression of the difference between the exchange value of a product and the exchange value of the materials , energy and labour-power used to produce it , or what Marx called “surplus value” . Similarly , the cost of production of a good is the exchange value of the other goods ( including labour power) used up in its production , while its selling price is the monetary expression of its exchange value . Since , as the classical economists and Marx showed, the exchange value of a product depends on the amount of socially-necessary labour incorporated in it from start to finish , the question arises of why calculations cannot be done directly in labour-time rather than in money. It is this reflexion that is behind all schemes for labour money and labour-time accounting . The reason why it is not possible to use labour-time as a general equivalent in place of money is that the exchange -value of a product does not depend on the actual amount of labour incorporated in that product in the course of its production from start to finish but on the amount of socially-necessary labour incorporated in it , which is by no means the same ( otherwise an inefficient worker would , because he took more time , produce more value than an efficient worker , but this is not the case). While the actual amount of labour spent on producing a good could theoretically be measured , what labour is socially necessary is a social average - taking into account average techniques , average productivity , average intensity of labour , etc- that can only be established through the social process that is the operation of the market price whose price changes reflect the changes which are continuously taking place in the various factors we have just mentioned which determine the average . In other words , it is an average that can only be established after a good has been produced . This was why Von Mises was right to say that - under capitalism of course- the only possible unit of economic calculation is money not labour-time , but this point had already been made by Marx when he discussed , and dismissed , various schemes for labour -money in 1859 in his A Critique of Political Economy . Under these circumstances calculations concerning the production and distribution of wealth will of course be necessary , but these can be done exclusively in units to measure specific amounts and kinds of different goods - units such as kilos , litres , square meters , watts , even hours . There will be no need for any general equivalent by which to measure and compare all goods . In other words, calculations in socialism will not be economic but technical . In socialism calculations will be done directly in physical quantities of real things , in use-values , without any general unit of calculation . Needs will be communicated to productive units as requests for specific useful things , while productive units will communicate their requirements to their suppliers as requests for other useful things . How this might work is outlined in the following article . Defenders of capitalism never seem to ask themselves the practical question about what the critical factor determining a production initiative in a market system , and moreover , what is the function of a cost/price calculation in relation to that initiative . The answer is obvious from everyday experience . The factor that critically decides the production of commodities is the judgement that enterprises make about whether they can be sold in the market .Obviously , consumers buy in the market that they perceive as being for their needs . But whether or not the transaction takes place is not decided by needs but by ability to pay . So the realisation of profit in the market determines both the production of goods and also the distribution of goods by various enterprises . In the market system the motive of production , the organisation of production , and the distribution of goods are inseparable parts of the same economic process : the realisation of profit and the accumulation of capital. There is no choice about this . Commodity production is organised within the constraints of the circulation of capital .This capital can accumulate , maintain its level or become depleted . The economic pressure on capital is that of accumulation , the alternative is bankruptcy . The production and distribution of goods is entirely subordinate to the pressure on capital to accumulate .Therefore the practical , technical organisation of production is entirely separate from the economic organisation of the accumulation of capital in which cost/price , value factors play a vital part. The economic signals of the market are not signals to produce useful things . They signal the prospects of profit and capital accumulation , If there is a profit to be made then production will take place ; if there is no prospect of profit , then production will not take place . Profit not need is the deciding factor . The real function of economic calculation in the market system is not to facilitate the practical , technical organisation of production ; it is ultimately about calculating the exploitation of labour . This market system , involving the circulation of capital , generates commodity values which are brought into a relationship of exchange in the market , so that value , surplus to the value of labour-power , embodied in commodities is realised through sales . When enterprises calculate costs as a relationship of labour-time to output this is not with a view to passing on socially useful information about the organisation of production . They are calculating costs plus the average rate of profit . Through the exchange of labour- power for wages , capital is invested in the power of workers to produce goods . It is with active labour functioning as deployed capital that capital expands . Labour-power generates more values than it consumes . These surplus values belong to the enterprise in the material form of commodities which are then sold on the market . This is where capital realises its self-expansion and thereby accumulates . The market price of commodities produced must exceed the price of the materials and labour-power required to produce them . This is what costing is all about , it has nothing to do with the practical organisation of production In its overall effect the subordination of useful production to the accumulation of capital distorts and constrains social production . The market is at every point in the system a barrier of exchange between production , distribution and social needs . The circulation of capital confines useful labour within a self-enclosed system of exchange . Labour is activated by an exchange of labour -power for wages and this is determined by the capacity of the market to provide profit through sales . Economic calculation is not part of the technical organisation of production ; it is an indispensable part of the accumulation of capital whether this takes place within the free market or under the system of state capitalism . What socialism will establish is a practical system of world production operating directly and solely for human needs . Socialism will be concerned solely with the production , distribution and consumption of useful goods and services in response to definite needs . It will integrate social needs with the material means of meeting those needs , that is to say , with active production . Under capitalism what appear to be production decisions are in fact decisions to go for profit in the market . Socialism will make economically-unencumbered production decisions as a direct response to needs . With production for use , the starting point will be needs . Socialism will not depend on calculations of labour-time or conversion of these into costs since production will not be generating exchange-values for the market . Production for use will generate useful goods and services directly for need, and this will require not economic calculation but the communication of quantities of materials throughout production . This will result from the change in productive relationships . The use of labour in a market system begins with an exchange of labour-power for wages , which is an economic exchange between individual workers and invested capital . This will be replaced by direct co-operation between producers to satisfy social needs in the material form of productive activity . Modern production embraces activity across the world as a network of productive links. It consists of decisions and actions by individuals , small groups and large organisations . Many of these dispersed activities interact with each other and alter the pattern of the whole .Modern production can only operate on the basis of particular production units being self-adjusting to social requirements in response to information being communicated to them . Socialism would take over existing world production which is generally structured on three scales. Socialism could rationalise this world structure on a decentralised basis which could operate in the most efficient way through a world , regional and local structure . Extraction and processing of basic materials such as metals , oil , coal and some agricultural products, etc could be organised as world production with distribution to regions and localities . These materials could be taken up the regions for the production and assembly of component parts of machinery , equipment and goods for distribution to localities within a region .This regional organisation could include the extraction and supply of those materials which could be contained within that region . A regional tractor -producing plant could take its materials from world supply and then distribute tractors down to the localities within that region . On the smallest scale , but nevertheless extremely important , local production units could be producing local goods for local consumption and use . This need not be a rigid arrangement , but an adaptable skeleton structure operating in these three , world , regional and local scales . These would represent the general scales of productive organisation , through which required quantities of materials and goods could be communicated between production units . Production for use could work with the basic structures as outlined above . It would operate in direct response to need . These would arise in local communities expressed as required quantities such as grammes , kilos , tonnes , litres , metres , cubic metres , etc , of various materials and quantities of goods . These would then be communicated as required elements of productive activity , as a technical sequence, to different scales of social production , according to necessity . Each particular part of production would be responding to the material requirements communicated to it through the connected ideas of social production . It would be self -regulating , because each element of production would be self-adjusting to the communication of these material requirements . Each part of of production would know its position . If requirements are low in relation to a build-up of stock , then this would an automatic indication to a production unit that its production should be reduced . If requirements are high in relation to stock then this would be an automatic indication that its production should be increased . The register of needs and the communication of every necessary element of those needs to the structure of production would be clear and readily known . The supply of some needs will take place within the local community and in these cases production would not extent beyond this , as for example with local food production for local consumption . Other needs could be communicated as required things to the regional organisation of production. Local food production would require glass, but not every local community could have its own glass works . The requirements for glass could be communicated to a regional glass works . These would be definite quantities of required glass . The glass works has its own suppliers of materials , and the amounts they require for the production of 1 tonne of glass are known in definite quantities. The required quantities of these materials could be passed by the glass works to the regional suppliers of the materials for glass manufacture . This would be a sequence of communication of local needs to the regional organisation of production, and thus contained within a region . Local food production would also require tractors, and here the communication of required quantities of things could extend further to the world organisation of production . Regional manufacture could produce and assemble he component parts of tractors for distribution to local communities .These would be required in a definite number and , on the basis of this definite number of final products , the definite number of component parts for tractors would also be known . The regional production unit producing tractor would communicate these definite quantities to their own suppliers , and eventually this would extend to worl production units extracting and processing the necessary materials . This would be the self-regulating system of production for need , operating on the basis of the communication of need as definite quantities of things throughout the structure of production . Each production unit would convert the requirements communicated to it into its own material requirements and pass these on to its suppliers . This would be the sequence by which every element of labour required for the production of a final product would be known . This system of self-regulating production for use is achieved through communications . 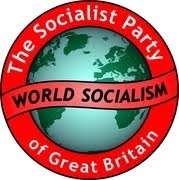 Socialism would make full use of the means communications which have developed . These include not only transport such as roads , railways , shipping etc. They also include the existing system of electronic communications which provide for instant world-wide contact as well as facilities for storing and processing millions of pieces of information . Modern information technology could be used by socialism to integrate any required combination of different parts of its worl structure of production . Defenders of the market such as Von Mises and Hayek appear not to understand the system which they represent . But this is not simply a matter of them putting forward fallacious assertions as a matter of ignorance . Their position is based on a crude defence of the privileged interests which do benefit from capitalism . In arguing in favour of these interests , it appears that any nonsense which defies the reality of experience will do . Their more honest position would be that the market system does work , but for those who monopolise the means of living and therefore economic calculation of the exploitation of labour is indispensable in pursuit of that interest . According to the Dualistic, or Dialectical Monism, (http://en.wikipedia.org/wiki/Dialectical_monism) every change has a Sense that is generated, can be understood and represented by means of couples of opposite and identical, different but complementary polar attributes. - Unity of the economic system and multiplicity of the firms that make it up. - Physical transformation and social trasformation, also called production and distribution. - Buying and selling in the social transformation. An economic system is a unit composed by a multiplicity of firms that produce and exchange commodities, therefore there are two kinds of transformation: physical transformation, or production, concerning the relationship between humans and physical world, and social transformation, regarding the distribution of the result of those physical transformations between the firms that produce them. This makes of the economic system an organic unit. Since the two kind of transformation are different, their characteristics are independent and can and must be considered separately, but since one of them cannot exist without the other, they must also be considered in their oneness. Every physical transformation is just but one event, and in this event there are two elements, or values: labor and commodity, which are different and identical. Labor decides the Sense of the transformation according to a plan, a project, and is the essential, or creative value of the event, while the corresponding commodity, for its physical characteristics, is the material value, or use value of that transformation. The gross product can be considered as a single commodity which use value is the quantified material life of the whole system, and its creative value the totality of labor. The use value of a commodity cannot be expressed as a mathematical fraction of the gross product’s use value, but its creative value is a fraction of the whole system’s quantity of time of labor. Physical transformation occurs as a process that is in the same time consumption and production, which, once again, are opposite and identical. The identity-duality rconsumption-production is generated by the relation labor-commodity, and the identity relationship between labor and product is as well a relationship of identity between labor and consumption. Regarding physical transformation, these considerations don’t depend on distribution and are valid no matter what the commodities’ economic value, or price, will be. Every firm yields the produced commodities to any other firm of the system in exchange for a quantity of commodities produced by them. Commodities are exchanged because they have different use values that satisfy different common needs, and a relation between different use values, as just said, cannot be expressed in quantitative mathematical terms. Indeed, a commodity is such not for its use value, but because it has a price, an economic value, which expresses the quantitative exchange relationship of every commodity with all the other commodities. The relationship of identity between material value and economic value goes together with the relation of identity and duality of buying and selling, opposite and identical. The price for which every single commodity is sold is also the price for which it is bought, and this is also true for the gross product. But while every commodity is exchanged with different commodities and their price change with distribution, the gross product is always exchanged with itself, so that its price is constant and is the mathematical one, 1, the unity of the system, to which all prices refer as a fraction of. Price expresses the quantitative relationship between unity and multiplicity, between every commodity and the gross product - or every firm and the whole system - and, consequently, between every single commodity. These considerations about distribution are made without any reference to production, and regard the relative aspect of the economic value. As creative value and exchange value refer to different changes, there is no reason for them to coincide, that is, the relation between quantity of labor of a firm and quantity of labor of the system, which is constant, normally is not equal to the fraction of the gross product that its price represents, which is variable. In the negotiated exchange, a commodity is bought for its material value, while the quantity of labor spent to produce it is invisible and is only one of the many causes for the magnitude of price, which eventually is the real economic value. But the commodity, or material value, belongs perfectly to both physical and social transformation, which imply one another through the whole system, where the creative value of the gross product is the totality of time of labor, which is constant for every possible distribution as well as its material and economic value are. determines the absolute value of the currencies in terms of quantities of social labor. Prices always represent precise quantities of time of quantified human existence, a fraction of the time of labor of the economic system, of the labor of each for the others, independently from the commodities’ material value and the way they are distributed, that is, whatever they are used as means of production or consumer goods, and however the magnitude of prices can vary in order to ensure the condition of balance (buying-selling identity) for different possible distributions.